US Secretary of State John Kerry says he is concerned by the pace and scope of China's reclamation projects in contested areas of the South China Sea. He was speaking at a press conference with Chinese Foreign Minister Wang Yi in Beijing. China claims almost the whole of the South China Sea, resulting in overlapping claims with Brunei, Taiwan, the Philippines, Vietnam and Malaysia. Mr Wang said that China was determined to safeguard its sovereignty. Mr Kerry is due to hold a series of meetings with Chinese President Xi Jinping and other top government officials in the Chinese capital. US officials had been briefing in advance that Mr Kerry was planning to deliver a stern message to China about what is alleged to be its huge land reclamation operation around some of the disputed reefs and islands it controls in the South China Sea. At the joint press conference, Mr Kerry said that one of the strengths of the modern US China relationship was that the two sides could speak candidly and he said he urged China, through Mr Wang, to take actions to reduce tension. Ahead of the meeting though, China had already pushed back at any suggestion it should moderate its behaviour, with state media accusing the US of "thinly veiled hypocrisy". The conflicting claims to island chains in the South China Sea, like the Spratlys and Paracels, go back decades. But the US concern is that new Chinese assets, like military capable runways, will alter the balance of power. What is South China Sea dispute? Speaking after his meeting with Mr Wang, Mr Kerry said he "urged China... to take actions that will join with everybody in helping to reduce tensions and increase the prospect of a diplomatic solution". Mr Wang replied that "the determination of the Chinese side to safeguard our own sovereignty and territorial integrity is as firm as a rock and it is unshakeable". He described the development work in the South China Sea as something that fell "within the scope of China's sovereignty". But he also said that China and the US had "more common interests than differences", urging both sides "to act in the spirit of mutual respect, seeking common ground while shelving differences". US officials say China has reclaimed about 810 hectares of land (2,000 acres) of land in the disputed Spratly Islands since 2014. 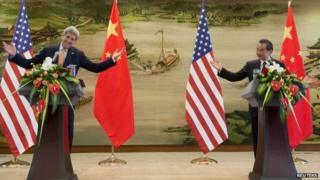 Mr Kerry's visit comes as the Indian Prime Minister Narendra Modi wraps up his visit to China. The two sides have signed trade and economic co-operation deals worth $22bn ($14bn) in Shanghai. On Friday, Mr Modi and China's Premier Li Keqiang said they agreed to seek a "fair resolution" to border disputes arising from a boundary disagreement.